Domestic subjects form a distinct and delightful category within Hitchens’ oeuvre, as attested by such titles as Moatlands Interior (1929), Figure Reading (1935), Studio Nativity (1941), Woman Knitting (1943), Boy at Breakfast (1945) and Interior with Woman Brushing Hair (1959). His marriage in 1935 and the birth of a son in 1940, soon followed by a dramatic relocation to a gypsy caravan in Sussex woodland, together prompted a number of paintings and ink drawings focussing on everyday scenes of family life. Piano Player belongs to the period 1935-45 when he was particularly prolific in this genre. In it the player of the piano was the artist’s wife Mollie (who, in her youth, had seemed destined for a career in music). The piano itself was a grand, salvaged from the bomb-damaged studio in Swiss Cottage and rehoused in the painter’s new studio—naturally the first part of the permanent home to be built, while the caravan remained for some time the family’s living quarters. First things first. Painting these intimate impressions of family life, Hitchens found the balance between figuration (recording the thing seen) and abstraction (following the aesthetic demands of the painting itself) was harder to maintain than in his landscapes, flower pieces and even his nudes. The difficulty was at its most acute in the rendering of the face. Hitchens’ nudes tend to have schematic heads with faces left blank: no problem there. But, to take one example of an interior with figures, in Boy at Table (1944) the boy’s head is featureless while that of his mother, though painted with a deft economy worthy of (and reminiscent of) Matisse, strikes one as comparatively realistic. The differing treatment is slightly disconcerting. Similarly, in Piano Player, the player’s face may seem at once too realistic within an otherwise largely abstract composition and not realistic enough in terms of a true likeness of Mollie Hitchens. Hitchens was not alone among his contemporaries in experiencing this ‘Problem of the Face’. In many of Henry Moore’s sculptures the treatment of the head in relation to the body is not entirely resolved, while in Lynn Chadwick’s the radical substitution of a rectangle or a triangle for the head can seem disturbingly alien beside the comparative realism of the bodies that support them. 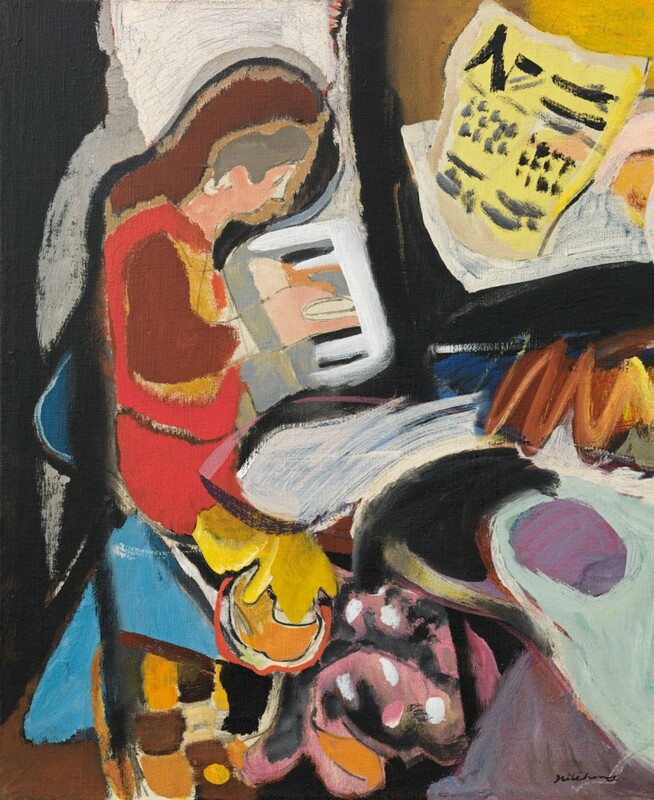 A closer parallel can be found in the many paintings and drawings of piano players that Ceri Richards made at much the same time as this one by Hitchens. He treats the head either in a scribbled version of a Picasso head of the late ’30s or else he loses it altogether in a welter of wiry arabesques. Both tactics betray the presence of this underlying problem. More generally, the danger of figuration in an otherwise largely abstract painting (the prime example being Hitchens’ grand mural at Cecil Sharp House) is that it sets the viewer off trying to ‘identify’ other parts of the painting. After recognizing a bit of keyboard and the piano’s black frame, some sheet music and perhaps a pot of flowers, one is hard put to it to read the rest of this painting in similar terms. But to appreciate it purely in terms of colour-shape and pattern is equally impossible, and surely not what the artist intended. I have dwelt on this difficulty of figuration-within-abstraction because I know that it was something Hitchens himself was well aware of and felt to be something of an Achilles’ heel. Naturally it need not spoil our own enjoyment of this unusual and very personal painting. Sydney Ivon Hitchens was the only child of artist Alfred Hitchens and Ethel Margaret Seth-Smith, a talented amateur artist. Following his early education at Conamur School, Sandgate, Kent, Hitchens attended Bedales School, Hampshire from 1903 until acute appendicitis cut short his school days and sent him on a recuperative voyage to New Zealand. Hitchens’ art education began at St John’s Wood School of Art, London from 1911 and continued at the Royal Academy Schools from 1912-16. He returned to the RA Schools between 1918-19, following two years’ service in hospital supply during the First World War. Still not fully recovered from his youthful illness, Hitchens was declared unfit for active service in 1916. After graduating from the RA Schools, Hitchens moved into a studio at 169 Adelaide Road, Hampstead in 1919 and later became part of a circle of avant-garde British artists including Barbara Hepworth, Henry Moore, Paul Nash and Ben Nicholson living in Hampstead in the 1930s. In 1920 he exhibited at the first exhibition of the Seven & Five Society, becoming a member that same year. Hitchens was elected a member of the London Artists’ Association in 1929, of the London Group in 1931 and of the Society of Mural Painters in 1937. The artist exhibited with the Leicester Galleries from 1940 until 1960, when he moved to the Waddington Galleries. Hitchens married Mary Cranford Coates on 27th June 1935. He and his wife left London in 1940 with their only child, John, for a caravan at Greenleaves, Lavington Common near Petworth, Sussex, after a bomb landed next door to his Hampstead studio. For the next forty years, Hitchens’ six acres of woodland near Midhurst became his home, place of study and constant source of inspiration. In 1951 the artist won a purchase prize at the Festival of Britain exhibition, 60 paintings for ‘51. Hitchens completed a mural at Cecil Sharp House, Regent’s Park Road in 1954, and installed another mural at the University of Sussex in 1962. In 1956 the British Council arranged a retrospective exhibition of his work for the Venice Biennale. In 1957 Hitchens was created CBE. A major retrospective of Hitchens’ work was arranged by the Arts Council at the Tate Gallery, London in 1963. In 1979 a third retrospective exhibition was held at the RA Diploma Galleries.